When Philip Kaufman purchased the film rights to The Unbearable Lightness of Being, he recalled that its author Milan Kundera had once taught at FAMU, the Prague film school, and so his advice was sought about how best to go about translating it into another medium. Kundera's response was neatly encapsulated in the single word 'Eliminate' - he didn't so much suggest as insist that Kaufman strip his novel to its bones, to seek out its essence. 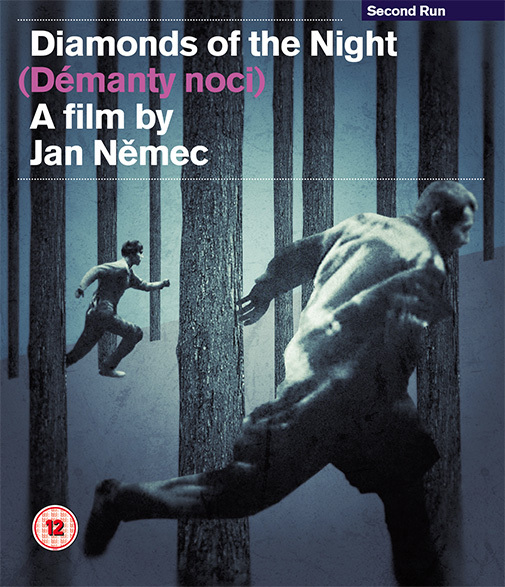 It was a maxim that one of Kaufman's associates on that project, Jan Němec, had already taken to heart when adapting Arnošt Lustig's autobiographical novella Darkness Casts No Shadow (Tma nemá stín) into his feature debut Diamonds of the Night. In fact, Němec had gone much further than Kaufman subsequently dared - he eliminated almost everything aside from the central scenario of two boys fleeing a German train during World War II and trying to stay alive. Whereas Lustig included dialogue on almost every page, there aren't much more than twenty lines in the entirety of Němec's film: it is almost entirely comprehensible even without subtitles. Lustig's protagonists constantly recall and discuss their experiences in various Nazi camps, usually with each other, but Němec reduces these to ultra-brief, often silent, invariably private personal flashbacks. Indeed, Němec almost goes to the ultimate extreme of removing any clues as to the historical period. The boys wear overcoats with KL (Konzentration Lager) painted on their backs in thick white brushstrokes, some of their fellow prisoners on the train wear the striped pyjamas characteristic of inmates of Nazi concentration camps, and the boys' eventual captors speak German, but that's more or less it. Lustig gave the boys names, Manny and Danny, that suggested Jewish origins, but there's no trace of this in the film, which simply cites the actors Antonín Kumbera and Ladislav Janský. Even the press notes circulated to festivals, critics and distributors merely named them 'First' and 'Second', as though their entire identity has been usurped by numbers - not far removed from the boys' presumed experience in the camps. Lustig wasn't the least bit offended by this apparent rejection of much of his work: he co-wrote the screenplay with Němec and subsequently commended Diamonds of the Night as his personal favourite of all film adaptations of his novels.